Lucy Wenger from Greening Australia talks about her experiences and impressions as the new project manager of the Rivers of Carbon – Goulburn District River Linkages project. I have a long-term interest in river health, and have been part of a community group looking after Ginninderra Creek in the ACT for as long as I can remember. It was there that I developed a love of birds and discovered the phenomenal abundance of bird species in riparian habitats, with my local creek a vibrant wildlife corridor. In just 1.5 km of creek surrounded by 30 hectares, I’ve identified over 120 species, which is remarkable given its urban setting. This interest led me to study environmental science and biology at the Australian National University, including a research project for Honours on fish ecology. My first job out of University was working as a labourer on an organic farm, where I helped to sell produce at the local Farmers’ Markets. I feel this gave me a unique perspective on managing the land for both production and wildlife. At the same time, I had a part time job at CSIRO working on a waterbirds project along the Murrumbidgee River. This work led to the 2018 publication of a book on waterbird chick development. 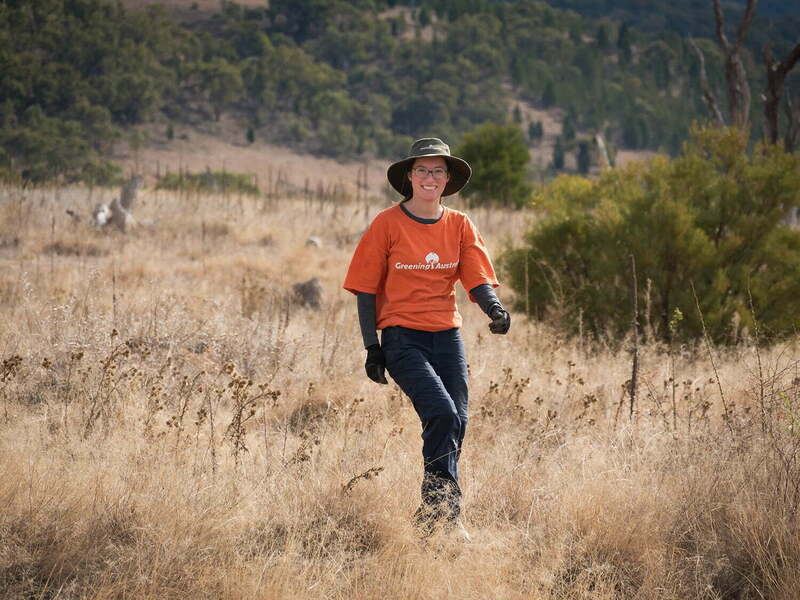 I started out at Greening Australia in early 2017 as a member of the Bush Crew, planting trees, shrubs and grasses across the Canberra region, from Cooma to Crookwell. It was an amazing experience, and I went many areas of rural NSW with diverse landscapes and learning different planting techniques. I found it inspiring to see what landholders are achieving on their properties, as well as the potential for restoring land condition. Many of the landholders had completed previous projects with Greening Australia, or other agencies like Local Land Services (even as far back as the 1990s), and it was extremely rewarding to see how sites can change over time as a result of our project works. Tree planting at the Rivers of Carbon – Goulburn site. Trees being planted on a Rivers of Carbon – Goulburn site. Working on the Rivers of Carbon – Goulburn District River Linkages project has taught me so much about riparian systems, and I have seen first-hand the large spectrum of waterway condition across the Goulburn region. For example, I’ve been to some beautiful, almost unmodified sites, with a high diversity of native trees, shrubs and groundcover species, supporting an associated high diversity of birds. Thanks to the Rivers of Carbon project, many of these sites have now been protected by fencing them off from livestock. Regrowth starting to come back and stabilise. Lucy with the Greening Australia truck. Greening Australia Volunteers planting on one of our RoC Goulburn sites. Other sites I’ve been to have been entirely cleared of native trees and shrubs, and in their own way are no less rewarding to work on. By protecting the waterways and re-introducing plants, you’re able to transform the landscape. I’m occasionally surprised at the birdlife in these cleared paddocks, such as a large number of Flame Robins at a recent site near Collector. Most of the landholders I’ve met really care about their land, and want to leave it in a better condition than when they started. One landholder I talked to recently is actively trying to make his farm more environmentally friendly, and at the same time more profitable, by consulting experts to improve his farming techniques. Ecologically healthy farms are able to restore nutrient cycling, water holding capacity and maximise photosynthetic production. Having recently read Charles Massy’s ‘The Call of the Reed Warbler’, it’s inspiring to hear tales of farmers taking land out of production and revegetating to increase income and drought resistance. I’m delighted that I now find myself in the position to facilitate such endeavours through the Rivers of Carbon – Goulburn District River Linkages project. The project aims to rehabilitate and connect riparian areas to boost native vegetation, increase biodiversity, reduce sedimentation, and improve stock management. The project is now in its third year, and has already attracted 21 landholders. We are seeking additional landholders to work with us over the next two years to protect and enhance 35 kilometres of riparian corridor, as well as linking 2200 hectares of remnant vegetation. Overall, we will plant 24,500 tubestock and do 50 kilometres of direct seeding using local provenance seed. Funding is also available to assist with fencing, alternative water (to offset loss of access to the waterway), minor erosion works and willow removal. If you are interested please get in touch with me, I would love to talk to you and see if you can become part of our Rivers of Carbon: Goulburn District Linkages project. Rivers of Carbon – Goulburn District Linkages is funded by the New South Wales Environmental Trust Bush Connect Program.